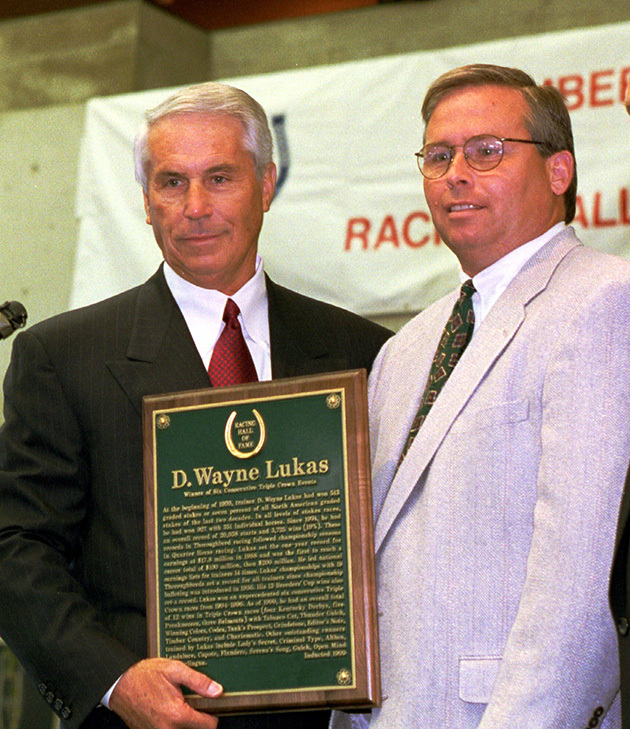 A tribute to Jeff Lukas, the only son of Hall of Fame trainer D. Wayne Lukas, as well as his former top assistant, who died at 58 on Wednesday morning. We often talk about courage in sports, a reliable trope by which we can attach worldly importance to games. And it’s true that it takes courage to stand alone on the free throw line with a game in the balance, to put on a football uniform and collide with other humans at high speed or to face down the final miles of a marathon and continue on despite the pain. It’s all very real. But that is just one narrow kind of courage, a courage in search of victory, joy and celebration. A bravery of choice. Life outside sports often beseeches another kind of courage altogether. For several weeks in the late summer and early autumn of 2013, I reported and wrote a story on former thoroughbred horse trainer Jeff Lukas, who died in Oklahoma Wednesday morning of an apparent heart attack at age 58. That story is presented here and today on various social media not because I want your page views or your hosannas, but because you should take a few minutes to read about Jeff Lukas’s extraordinary life, and extraordinary courage. He was, in many ways, the bravest man I have ever known. In 1993, Lukas, then 36, was the first lieutenant to his father, legendary (even then) trainer D. Wayne Lukas, an outsized figure who, as I wrote in 2013, "…rode a saddle pony and wore leather riding chaps and a white Stetson in the morning and $3,000 suits and aviator shades in the afternoon." 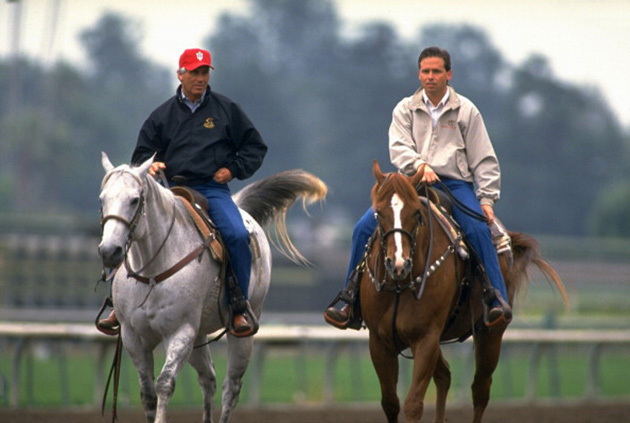 Wayne Lukas built a coast-to-coast racing operation unlike any in the sport’s history, with 400 horses, 380 employees, a private jet and a helicopter. Jeff, Wayne’s only child, was his right-hand man, a demanding taskmaster who kept the operation on its many rails. "Jeff was the glue," said trainer Todd Pletcher, once a member of Team Lukas and now a world-class trainer on his own. On Dec. 15 of that year, Jeff Lukas was working the Lukas barn at Santa Anita Racetrack in Southern California when Tabasco Cat, a promising but rambunctious two-year-old colt (who would go on to win the Preakness and Belmont Stakes in the spring of 1994) got loose. As the horse ran at high speed, Jeff Lukas jumped in front of him, which will often compel a thoroughbred to stop. (This, too, was an act of bravery, trying to prevent a loose, frightened horse from harming himself or others). In this case, it did not. Tabasco Cat crashed into Lukas and tossed him into the air; Lukas landed on his back and his head smashed against the ground. Lukas’s skull was fractured and his brain badly injured. His condition, neurosurgeon Dr. William Caton would tell me in 2013, "was not compatible with survival very often." Lukas did survive. His cognitive and physical abilities improved rapidly at first, giving rise to hope that he might recover his life. That had been a good life, a rich life. He was married to Linda and they had two children, Brady (then three years old) and Kelly (10 months). But just as quickly as Jeff improved, he plateaued. His brain and his body did not fully recover and he would never return to that former life, but instead to a very different life, one without his wife, his children or his father. One without horses. He would bounce from California to Wisconsin to Florida and finally to Oklahoma, where in 2007, David Burrage, a good friend who had been the general manager of Lukas Racing Stables form 1980-’99, gave Jeff a job transporting documents among bank branches and helped him move into a ranch home that Wayne Lukas purchased. There Jeff Lukas lived until his death. In reporting the 2013 story, I visited the members of Jeff’s family: His ex-wife Linda (remarried for the second time), Kelly (then a college soccer player) and Brady (an Air Force Academy graduate and now stationed in Qatar). They are all wonderful people, living with the scars of an unthinkable twist. As I wrote then, Tabasco Cat ran over Jeff, but in truth he ran over all of them. 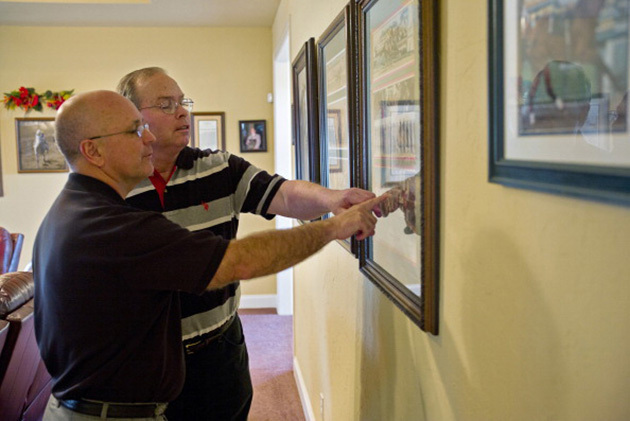 I visited Jeff at his home in in the small Oklahoma town of Atoka. Before his injury he had been meticulous and he remained so. There was not a speck of dust in his home or a misplaced glass in the kitchen. Jeff narrated his life for me in the tones of a broadcaster, speaking for stretches surpassing 20 minutes about the careers of some of the horses he trained, most pointedly 1986 Horse of the Year Lady’s Secret and 1988 Kentucky Derby winner Winning Colors. He showed me his many Eclipse Awards and beamed at photos of his children. We sat in his living room and talked about the past and the present. When it was time for me to leave, he drew me a map to the interstate in freehand, and my goodness, the lines were pin-straight, the angles a perfect 90 degrees. As I turned my rental car around in the driveway, Jeff activated the garage door opener and stood still as it dropped to the concrete floor. Back then I struggled with whether to label Jeff’s story a victory or a defeat. After all, I am a sportswriter, beholden to the boxscore. Jeff defeated a brain injury that nearly killed him and lived 22 more years. Yet there was so much pain for so many. In the end, I decided that it was neither a win nor a loss in the absolute, because life is not black and white. Life is grey. Three years later, I understand something more. Jeff Lukas lived with a traumatic brain injury, but he absolutely understood what had happened to him and what been lost. He said this to me in ’13: "…I’m proud that I stayed determined, focused and worked my way back to be here working with these people. I couldn’t be in a better spot." When I asked if he missed his old life, he wobbled his hand from side to side, but did not answer pointedly. Where others might have wallowed in self-pity, or worse, Jeff moved forward. He played the cards that were dealt, lived the life that was presented to him. And it was not an easy life. ``He was so brave,’’ said David Burrage Thursday morning. "I couldn’t have done that. Could you?" This is the lesson that Jeff Lukas leaves behind. We are a society of complainers, railing at the inconveniences of a narrow airplane seat or a slow Internet connection. Jeff had his entire life taken away—a big life—and embraced his new one. ​Burrage told me that little had changed in Jeff’s routine since my visit to Oklahoma in the fall of 2013. Jeff continued to perform his delivery job (with a driver, as had been the case for many years), go to church on Sundays and talk regularly with his father and his son – who might go into the horse business when his Air Force hitch is up in 2018—about the runners in the barn. Jeff called me after my story—his story—was published, and thanked me for writing it. We talked a few times after that; he was trying to write a book about his life as a trainer and he needed help. I didn’t have the time and I tried to find a writer who might, but failed. I feel badly about that. Last Sunday Jeff was just thrilled when his beloved Wisconsin Badgers won at the buzzer to advance to the Sweet Sixteen of the NCAA Tournament. He was raised in Wisconsin and never let go of that allegiance. On Wednesday morning he called his driver to say he wasn’t feeling well and wouldn’t be able to make his rounds. Burrage returned home from a trip in the early afternoon and was told that Jeff wasn’t answering his phone. They found him shortly past 2 p.m. There will be a ceremony next week in Oklahoma, which the family is expected to keep private. The racing community will mourn a great career cut short and recite the names of fast horses who Jeff nurtured and gifted trainers who he mentored. His family will remember a man who kept trying to be a father, even when that job was made more difficult than any of them could have imagined. I will remember a garage door slowly closing, and a man on the other side who never gave up.